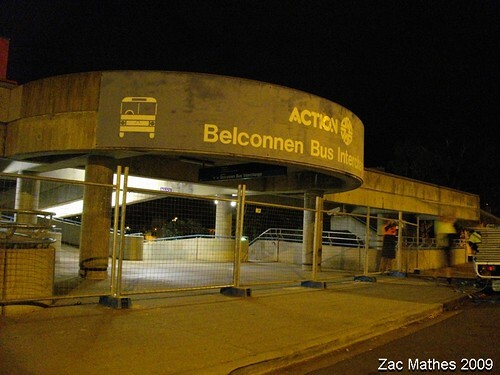 On 24 May 2009, BUS 300 departed Tuggeranong Bus Interchange on a Route 900 bound for Belconnen. 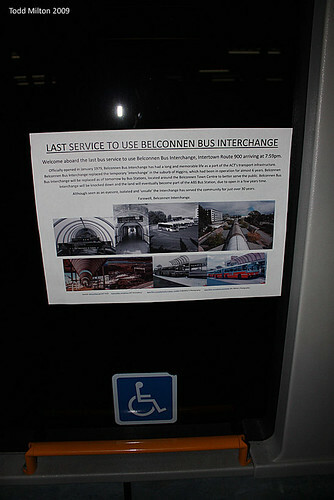 This bus was the last bus to ever service the Belconnen Interchange. Martin, the driver of this service, is a member of ACT bus and allowed myself and Todd Milton to tag along for the trip to Tuggeranong and back. While at Tuggeranong the bus was decorated with many posters made by Todd. One of the larger posters. The route was rather busy and people took notice of the posters – some fascinated by the old pictures. Todd and myself were on hand to answer any questions people had to ask. 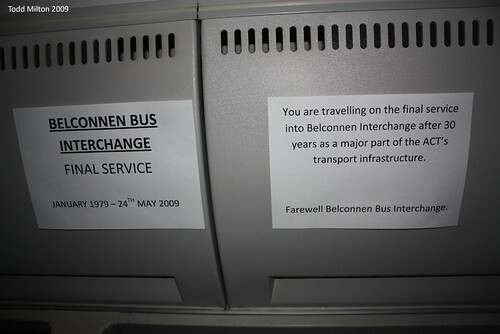 Once the passengers were off the bus we were taken on one final lap of the interchange. After the bus had departed Todd and myself took the time to try and get detailed pictures of every aspect of the interchange. After hanging around for about an hour we decided that we better leave as the workmen were now starting to fence the Interchange off. We took one last photo of the Interchange as we returned to the car. We would like to thank to say a huge thankyou to Martin for allowing us to decorate the bus and another huge thankyou to Todd Milton for taking the time to make all the wonderful posters that we used on the night to decorate the bus with.